Zoho Social is a social media management program that allows businesses to manage multiple social accounts in a single platform. It allows users to publish their posts and track the performance of their content through its analytics and reporting functionalities. We compiled Zoho Social reviews from our website and from around the web and determined that it has generally positive ratings. We also shared its available pricing options. Users who gave Zoho Social positive reviews said that the app’s interface is very user-friendly. Two favorites functionalities by users are the Bulk Uploader and SmartQ (automated intelligent posting feature), which help them save a lot of time when scheduling social media posts. They also said that the product is quite robust for its pricing. Users who gave Zoho Social negative reviews said that the analytics could be improved, citing that the dashboard sometimes does not show real-time statistics. They suggested including Pinterest and private LinkedIn accounts among the social media platforms that can be managed by the app. Users also said that the customer service quality could be better. Zoho Social has two types of subscription plans: For Individuals and Businesses (ranges from $0 to $50/month) and For Agencies (ranges from $83.33 to $125/month). The main differences between the plans include the payment scheme and brands included, as well as access to premium features such as bulk scheduler, advanced analytics, custom domain, and more. *Users can purchase add-ons such as additional team members ($10/member) and Brands ($10/brand) under the Standard plan. Subscribers of agency plans can purchase up to 5 additional team members or 5 additional brands at $350/year. Users managing more than 50 clients may contact Zoho Social support for customized pricing quotations. Check out the list below of some of Zoho Social’s features. How to Create a Facebook Business Page in 6 Steps — A Facebook business page is a free public profile you can create for your local business, brand, or product. Check out this article where we go through the steps one-by-one. Zoho Articles — Check out our rich resource of other Zoho-related articles. Does Zoho Social offer a free trial? Yes. Zoho Social offers a 15-day free trial for all its paid plans. Once the trial period expires, you will be downgraded to the Free Plan or have the option to subscribe to a paid plan. No. Zoho Social does not require credit card details for its free trial. Are there available Zoho Social materials where I can get more product information? Interested users may click here to check out available Zoho Social webinars for more information on how to use the product. This video provides an overview on how Zoho Social can help businesses reach their customers the right way and strengthen their brand. Not sure if Zoho Social is the right fit for you? Read our reviews of all top social media management software or check out one of these three Zoho Social alternatives. ZohoSocial makes it easy to post to multiple social accounts so that i don’t have to do it manually for each account. It’s a super simple interface. And the scheduler means i can sit down on a Sunday and just preload a whole bunch of posts at one time. I don’t really have a negative criticism here. just the pricing structure and how to set up each of the accounts more easily. Zoho Social has a lot of features for the price, whilst it doesn’t have every feature imaginable in a social media management tool it has a lot for the price. The UI for the product isn’t fantastic, to be honest if you have used a Zoho product you will know a lot of their products leave a lot to be desired when it comes to the user experience. Zoho are very much focused on building features (which is great) but seem to spend very little time on a good user experience. A nice user experience makes a product like this so much more enjoyable to use. The product lacks that wow feature. Buffer has the queue system, RSS feeds you can easily add to your queue. It makes it stand out. MeetEdgar has the calendar where content is evergreen and constantly posted out. Zoho Social is lacking that feature that makes you really feel like you need it. Overall, ZOHO SOCIAL is great because the dashboard is easy to set up, connects simultaneously with all major platforms, allows the user to monitor and generate analytical reports. Buffer would be a major competitor for free or low-cost social media automation. Buffer makes sharing and scheduling super easy [including the option to choose images for link shares], but they have not rolled out an analytics dashboard [still in beta testing], and any shares through Buffer are branded [ie: “shared by Buffer”] Sprout Social is the alternative for a more expensive, high-end dashboard. For beginners, there IS a learning curve, which means taking time out of your work day to sit through recommended webinars, and downloading long pdfs for basically each component of the website. ZohoSocial offers a simple tutorial for beginning Social Media marketers and those looking to improve and elevate their personal brand. With any web or mobile app, the user experience has to be as simple and seamless as allocated – ZohoSocial is very great at that. 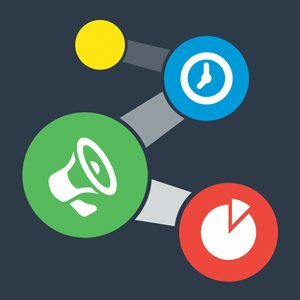 ZohoSocial teases users with The Freemium Model. There is the initial trial period, then there is the expectation to pay [a very low] monthly rate. However, The user has the opportunity to extend their free trial by referring to potential users, writing reviews, and completing other incentives. We’re talking up to 200 days of free usage. Ideally, I think it might be more beneficial to offer these incentives after the user has begun to pay for a monthly/yearly membership. This is the global problem with “The Freemium Model” in marketing. In theory, the user might figure out a way to use Zoho Social free for 100+ days, and then decide it’s not worth paying for the service after being accustomed to free usage. The product is really good. It is easy to use, offers a lot of features and some of them are really nice. Don’t know what to think about smart Q. It may work but I don’t see the difference. The support needs improvement. Takes days to get someone. In their defense, you won’t really need support because it’s easy to use. I’d like to be able to use that with my private LinkedIn profile. That there was that Zoho One Bundle that is cheaper overall. Don’t know what you get for that price but it’s cheap. The program is very user friendly…very intuitive if you’ve used any other scheduling program. The integration of SmartQ (a best posting time determination feature) is nice. I like that it works well with the most popular social media platforms: Facebook, Google +, Linkedin, and Twitter. My favorite feature is the bulk scheduler and the ability to upload a spreadsheet for scheduling. Saved me so much time. While the pricing is less than Hootsuite, it’s still a charge when it once was free. There were a few glitches I had, but customer service was able to assist. The reporting isn’t as detailed as some other programs, but for the money, it works. That the free version would be discontinued. But still, it’s cheaper than most of the other similar programs.